Pinterest is one of the fastest-growing social media sites on the Internet — especially among creative professionals and arts & crafts enthusiasts. Beautifully designed to emulate the clean, elegant aesthetics of Pinterest that users recognize and love, Pinterest Perfect! features the artwork, projects, and inspirational designs of talented artists and crafters, each of whom enjoys a sizeable fan base in the digital space and elsewhere. Filled with step-by-step projects, tutorials, art tips, and crafting techniques on everything from drawing, painting, and illustration to mixed media, typography, and papercrafts, each featured artist shares her unique art style with readers in an interactive and engaging format. Each section features a brief introduction to the artist, followed by four to six easy-to-follow, step-by-step projects and/or art techniques. Open practice pages at the end of each section invite readers to brainstorm, sketch, and collect inspiration for their own artistic projects. In addition, useful sidebars throughout the book share tips for using Pinterest efficiently and effectively, as a hobbyist and professional artist. Sidebar topics include creating a virtual artist morgue, collaborating with others on community boards, using boards to promote a business or share a portfolio, and much more. One part inspiration, one part how-to, and filled to the brim with color, inspiration, and beautiful artwork, Pinterest Perfect! 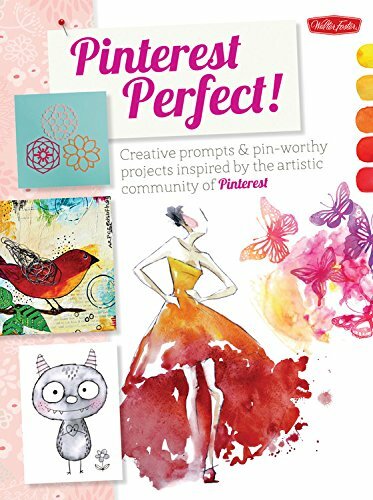 is the picture-perfect visual resource for any artist, crafter, or creative Pinterest enthusiast.